This spicy, tangy, bittersweet noodles are just an experiment. One of my favourite noodles in Yakisoba, but in Italy is impossible to find a single Japanese restaurant able to make it. So, while I wait to eat them in Paris at the end of November, I have to substitute it with something. Wash and clean the courgette and the aubergine and cut them in think but short sticks. Peel the carrot and cut it like the other vegetables. Heat in the wok the oil, add garlic and ginger, and after 2 minutes the vegetable in this order: carrot, courgette and only finally aubergine. Let them cook stirring constantly until softer, but still crunchy. Stir in the sake, let it reduce, the add the noodles and the rest of the ingredients. 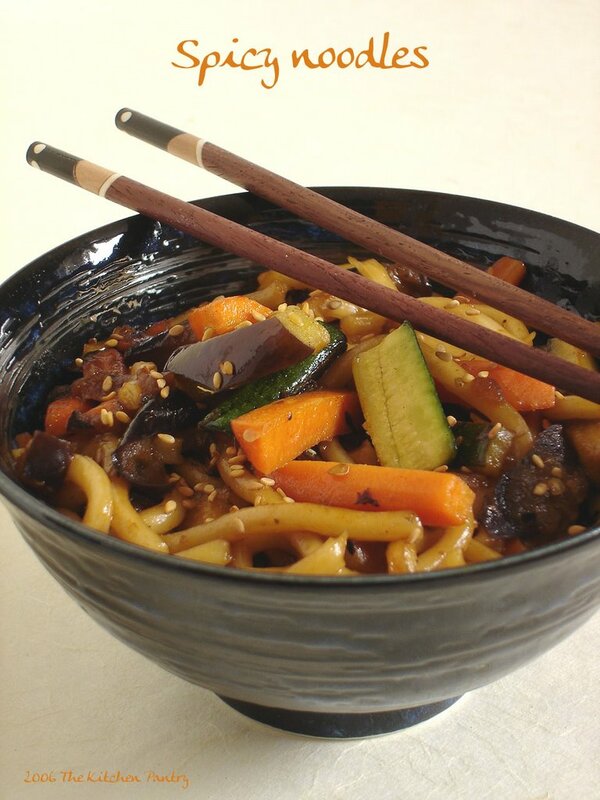 Let the noodles cook gently for 4-5 minutes, or until tender, stirring occasionally to coat them with the sauce. Serve immediately, with a good sprinkle of sesame seeds. 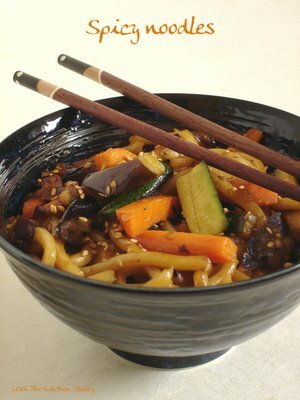 L’indirizzo del giappo devo ritrovarlo: yakisoba stupefacente! di inglese non ci capirò una cippa ma anche stavolta mi hai dato un’indicazione preziosa: lo speciale sale&pepe me lo sono comprato e messo già fra le cose importanti! !